So you thought Europeans were the only ones to have all the fun. No, we Americans get the Collection Edition love too, but we get it a bit differently. The US version of Street Fighter IV will have many of the same goodies despite the box art being different. It will include the same mini-strategy guide and exclusive DLC, but from there on out things start getting a little different. Some of the changes are for the better and some are for the worse. Under the “for the worse” category is the fact that the Crimson Viper and Ryu statues that came together in the European version have been split up. PS3 owners will get Ryu and 360 owners will land Crimson Viper, instantly making the PS3 version waaay better. That isn’t the only thing that makes it better though. 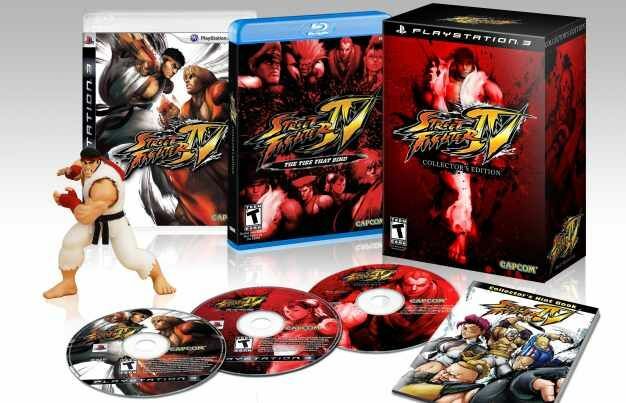 The PS3 will come a with a Blu-ray version of Street Fighter IV: The Ties That Bind, the SFIV anime. The 360 on the other hand will come with the same film, but on a special disc that isn’t a DVD and that lets it play in 720p. Good luck playing that anywhere else than your 360. However, in the “for the better” category, both system’s versions will include a CD soundtrack from the game so you can rock out to SFIV tunes all the time.